Each case comes with four 5-pound bags making it easy for storage and splitting with friends. 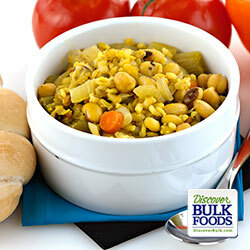 Try these new recipes or use these blends in your favorite family recipes! 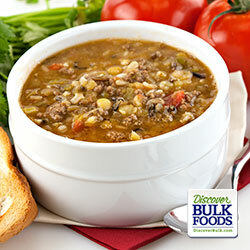 ​2 cups Harmony Soup Blend 1-3 lb. whole chicken 3 quarts water 1 T. dry savory leaves ½ tsp. black pepper 1 ½ tsp. garlic salt 1 quart water 1 cup fresh diced carrots 1 cup fresh chopped onion 1 cup fresh diced celery with leaves 2 tsp. salt (or to taste) ½ tsp. turmeric Soak the Harmony Soup Blend overnight in 1 quart water in the refrigerator, then drain and throw the water away. In a 6 quart pot, place the chicken, 3 quarts of water, and the pre-soaked blend. Add the garlic, salt, turmeric, black pepper and savory leaves then cook for 1 hour or until the chicken is tender. Remove the chicken so it can cool. Add the carrots, celery and onions. Cook for 20 minutes, while you de-bone the chicken. Add the cooked chicken meat and bring back to a boil. Remove from the stove and serve Product information/materials may change. 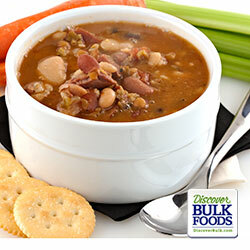 1 ½ cups 7 Bean Soup Blend 1 ham hock 1 medium onion, diced 2 cups celery, diced 2 cups carrots, diced 5 Tbsp. ATOD Old Time Smoked Ham Broth ½ tsp. black pepper ¾ cup flour 1 large egg Soak beans in 4 cups water overnight in the refrigerator. Drain the water. Simmer beans (enough to cover) until tender. Drain and reserve the liquid. Cook 1 ham hock in 2 quarts of water until meat falls from the bone. Dice meat and reserve broth. 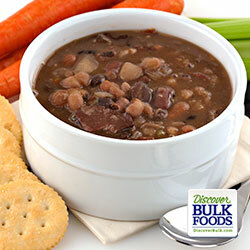 Combine reserved broth and liquid from beans (add water to make 2 quarts) and cook the vegetable until tender. Beat egg. Place flour in a bowl. Pour egg in the middle use a fork to draw egg through the flour to form crumbs. Sprinkle crumbs into boiling broth. Cover and simmer for 10 minutes. Add the ham & beans and serve. Product information/materials may change. Lima Beans, Cranberry Beans, Black Eye Beans, Red Kidney Beans, Great Northern Beans, Black Turtle Beans, Pinto Beans. 8 cups water or broth 1 ½ cups Hearty Soup Blend 1 ½ tsp. 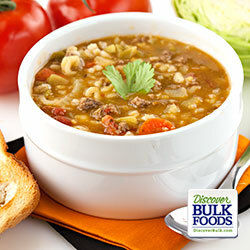 salt 2 carrots 2 celery stalks 2 cups shredded cabbage 1 quart tomatoes 1 lb ground beef Simmer Hearty Soup Blend for 1 hour. Add 2 carrots, 2 celery stalks, 2 cups shredded cabbage, 1 quart tomatoes, 1 lb. cooked ground beef. Simmer for 20 additional minutes. ​Green Split Peas, Yellow Split Peas, Non-GMO Brown Rice, Pearled Barley, Lentils, Pasta (durum semolina wheat, niacin, ferrous sulfate (iron), thiamine, riboflavin, folic acid). **Contains: Wheat Ingredients. 4 cups water 1 ½ cups Harvest Soup Blend 1 cup carrots (diced or sliced) 1 cup celery & leaf (finely chopped) 1 cup shredded cabbage 1 cup diced tomatoes 1 tsp. salt. More or less to taste ¼ tsp. pepper. More or less to taste 1 tsp. Chicken broth mix or bouillon cubes Place water and Harvest Soup mix in a heavy pot and simmer 1 hour. Add all other ingredients and simmer another hour. Options: Make with smoked sausage and add 1 cup of each, fresh-diced apples and sweet potatoes, instead of tomatoes. Other spices that can be added: savory, garlic and tarragon. Product information/materials may change. Lentils, Non-GMO Brown Rice, Green Split Peas, Yellow Split Peas, Wild Rice. 1 cup Golden Harvest Soup Blend 4 cups water 1 cup onion - diced 1 cup celery - diced 1 cup carrot - diced 1-1 ½ T. chicken base 1 t. turmeric ½ t. black pepper ½ t. parsley flakes Soak the Golden Harvest Soup Blend overnight in 2 cups of water. Drain and place in a kettle with 4 cups of water and simmer until tender. Add carrots, celery and onions. Add chicken base, turmeric, pepper and parsley then simmer for 10 minutes. Option: Add chicken broth, cooked chicken or cooked sausage. Option: add chicken broth, cooked Chicken Meat or cooked Sausage. 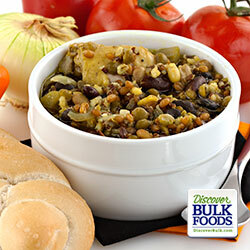 Black Eyed Peas, Yellow Split Peas, Brown Rice, Pearled Barley, Garbanzo Beans, Yellow Eyed Steuben Beans, Red Lentils, Golden 86 Spring Wheat Berries, Adzuki Beans, Spelt Berries, Expeller Pressed Non-GMO Canola Oil. **Contains: Wheat Ingredients. 1 cup Holiday Soup Blend 1 quart water 1 ham hock ½ c. diced onions 1-12 oz. can diced tomatoes ½ Tbsp. chili powder 1 Tbsp. lemon juice ¼ tsp. black pepper ½ tsp. salt – more of less to taste Wash beans, place into a plastic container and cover with 2 cups of water to let soak in the refrigerator overnight. Drain beans and place in a heavy pot or crock-pot. Add 1 quart water and all the other ingredients. Simmer for 3-5 hours. Remove the ham hock, take the meat off the bone and add back to soup. Product information/materials may change. Green Split Peas, Light Red Kidney Beans, Lima Beans, Black Eyed Beans, Lentils, Great Northern Beans, Pinto Beans, Yellow Split Peas, Black Turtle Beans, Pearled Barley.